Holocaust Memorial Day commemorates the victims of racial murder, both in the twentieth century and in earlier times. The day, 27 January, has been chosen because it was on that date in 1945 that the Russian army, in their march westward towards Berlin, liberated the concentration camp at Auschwitz. Ten weeks later, on 12 April, the British army liberated the camp at Bergen-Belsen, near Hanover. Norfolk men were among the first to open up the camp and to witness for themselves the horrors of the Nazi regime. At least one woman brought up in Norfolk suffered the experience of concentration camps, although she was lucky enough to survive and to tell her story after the war. She was Elsie Maréchal, whose maiden name was Bell. She was raised in Great Yarmouth and went to train as a teacher at the college in Norwich. At the time of the First World War, she met and married a Belgian, Georges Maréchal. She returned with him to his home country and was living there when the Second World War broke out. After the Germans invaded Belgium, Georges and Elsie helped British and American airmen who had been shot down to evade capture and make their way back to England. For this, Georges was shot and Elsie, with her small daughter, spent the rest of the war in prison and in camps at Ravensbrück and Matthausen. 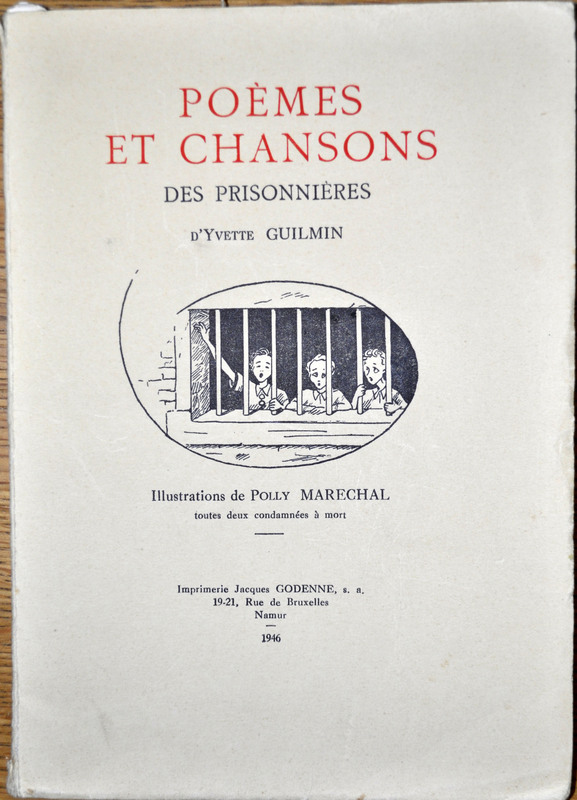 The Norfolk Record Office has a copy of the book of poems written while in prison by a fellow-prisoner, to which Elsie supplied the illustrations under her nickname of Polly. 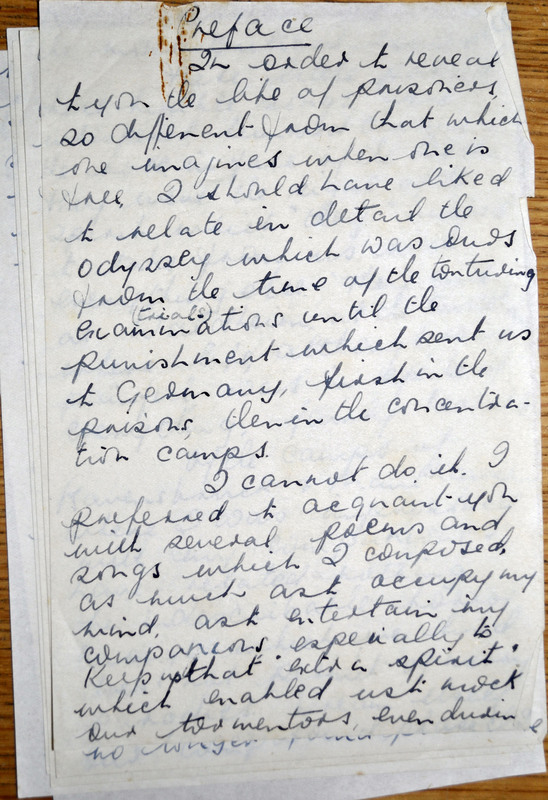 I should before familiarising you with a prisoner’s life, so different from anything you could imagine when free, tell you in detail about the odyssey which was ours between the torturing interrogations and the atonement which drove us to Germany, first into the prisons then into the concentration camps. I don’t wish to do that. 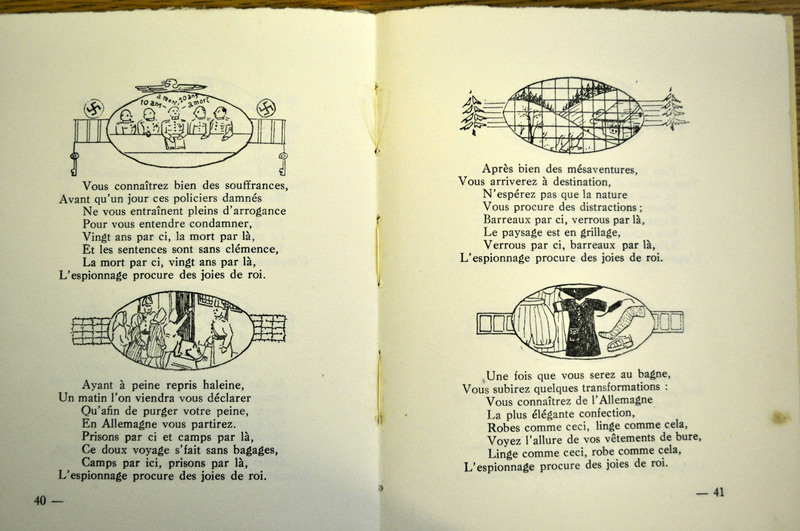 I prefer instead to familiarise you with a few poems and songs which I used to make up, as much to occupy myself as to amuse the people with me, but, above all, to keep up the incredible morale which allowed us to laugh at our tyrants, even at the most critical times…. May we always remember with pity all our dear departed, their suffering, their courage, their smiles their friendship, their heroic death …. The Forum in Norwich are commemorating Holocaust Memorial Day with this event. 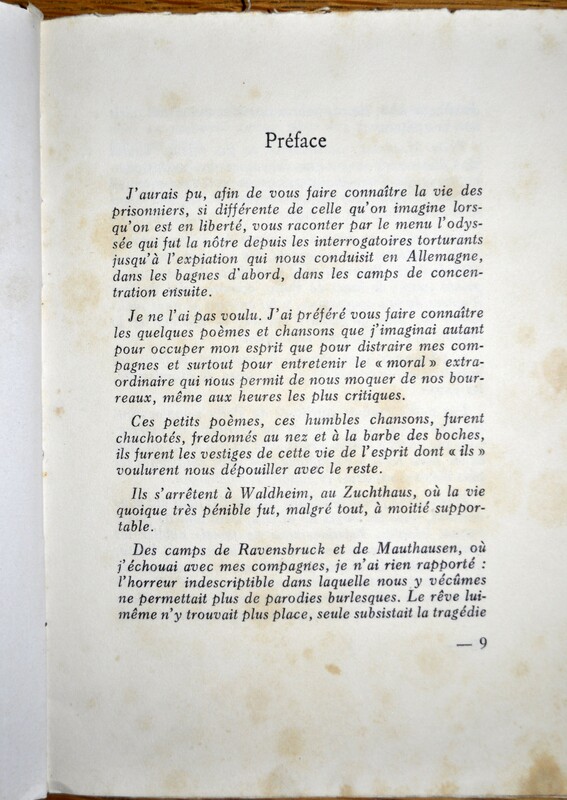 This entry was posted in Snapshots from the Archive and tagged great yarmouth, holocaust memorial day, illustration, poetry, Second World War, translation. Bookmark the permalink.